This post is from my good friend Nicole from deliajude who I coincidentally know from back in the cringe-worthy years. Thank you Nicole! I love parcels in the mail. 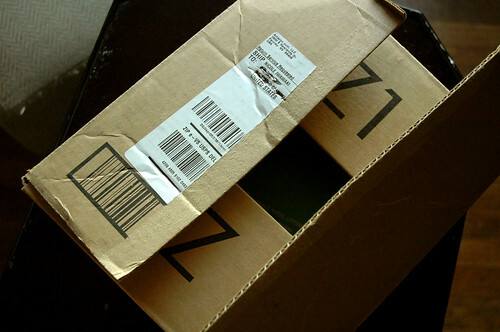 Even expected packages, you know, the kind you order yourself. This particular box was the kind of parcel I handpicked from Amazon. A just because I deserve a new book…or two. Books I had heard a many great things about. But how could I know just how amazing the books would be. The Gentle Art of Domesticity and Cringe. as I was not willing to pay shipping costs from the UK. A lovely little, or as the case may be, not-so-little book. I cannot wait to dive in…curled up on a cozy sofa with a cuppa joe in hand. When I flipped open Cringe the first thing I noticed was inside the book flap. The compiler, Sarah Brown, had a list from her teenage years of everything she wore to school for the school year 90/91. I started chuckling because somewhere is stashed a box full of my teenage journals and somewhere in that box is a journal, on yellow paper is written every thing I wore for in grade 10. Yeah, call me super vain! Or super insecure. I suspect the latter. I was inspired to pull out my old journals and notebooks and spend a couple of hours gasping at what I thought were huge life decisions…turns out I was a vain, selfish teenager who thought far too much about clothes, boys and death. Also, it appears I have since tossed a couple of teenage-angst-filled diaries and what remains are many journals from my twenties, clipping notebooks (articles and photographs), and prayer journals. I thought about giving you a wee sampling but instead I challenge you to unearth the journals of your youth and take a good look at your younger self. 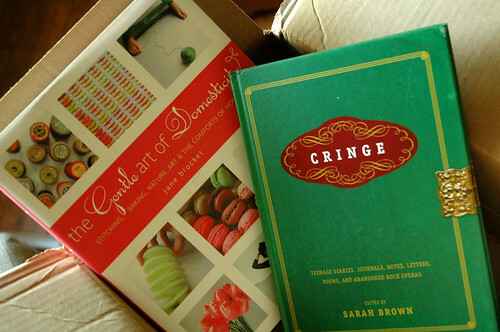 Or go out and buy Cringe, which by the by is the perfect name for such a book, and be entertained.